Justice Rowe was born in 1953 in St. John’s, Newfoundland and Labrador, to parents from small fishing communities. He attended Memorial University from 1970 to 1975 where he earned a B.Sc., and a B.A. in political science. He then attended Osgoode Hall Law School from 1975 to 1978, where he earned his LL.B. 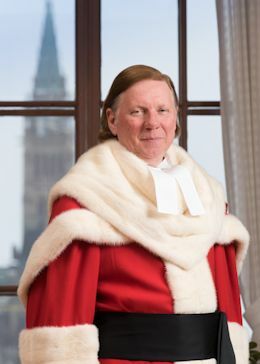 He was called to the Bar of Newfoundland and Labrador in 1978 and became a member of the Law Society of Upper Canada in 1986. Justice Rowe first worked as Clerk Assistant in the House of Assembly of Newfoundland and Labrador, where he served as procedural advisor to the Speaker. In 1980, he joined the Department of External Affairs as a Foreign Service Officer. In 1984, he joined the Ottawa office of Gowling and Henderson, first as an associate and then as a partner. While in private practice, he was part of the teams that handled disputes over the determination of Canada’s Atlantic maritime boundaries and overfishing on the Grand Banks of Newfoundland. He was also involved in the negotiation of a new United Nations convention on high seas fisheries, in initiatives of the UN Food and Agriculture Organization -- as well as in negotiations with the European Union. He was appointed Queen’s Counsel in 1992. In 1996, he became Clerk of the Executive Council and Secretary to Cabinet in the Government of Newfoundland and Labrador. He continued to advise Canada’s litigation team in regards to the fisheries case initiated by Spain before the International Court of Justice. He was also instrumental in securing a constitutional amendment to replace Newfoundland and Labrador’s denominational school system in favour of a secular one. Justice Rowe was appointed to the Newfoundland and Labrador Supreme Court, Trial Division in 1999 and was elevated to the Court of Appeal of Newfoundland and Labrador in 2001. Justice Rowe was a lecturer in public and constitutional law at the University of Ottawa, Faculty of Law, for two years in the early 1990s. He served as a member of the Council of the Canadian Superior Courts Judges’ Association. He was Chair of the Advisory Committee on Federal Judicial Appointments for Newfoundland and Labrador from 2006 to 2012. He is the author of “What is the Constitution of a Province”, a chapter in Provinces, edited by Prof. C. Dunn and published in 2015. From 2002 to 2016, he was involved with Action Canada, a youth leadership development program, as an advisor, mentor and member of the National Selection Committee. He was appointed to the Supreme Court of Canada on October 28, 2016. Webcast of the ceremony in honour of the Honourable Malcolm Rowe, held on December 2, 2016.